It wasn’t many years ago that animals seized from criminally-charged owners were viewed as evidence. These dogs were rescued from abusive or neglectful homes only to be left languishing in a cage until the conclusion of their owner’s court case. 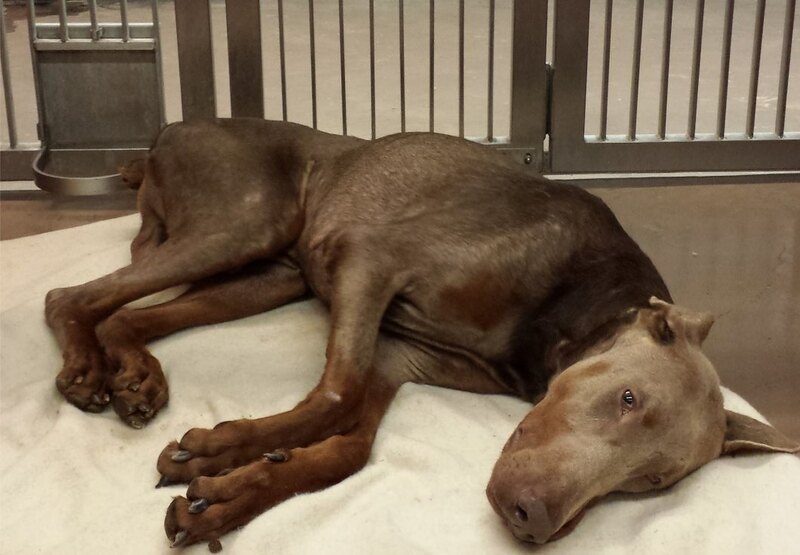 After satisfying their evidentiary role, 98% of them were then euthanized. In January 2010, Safe Humane Chicago took the first step toward justice for these animals. 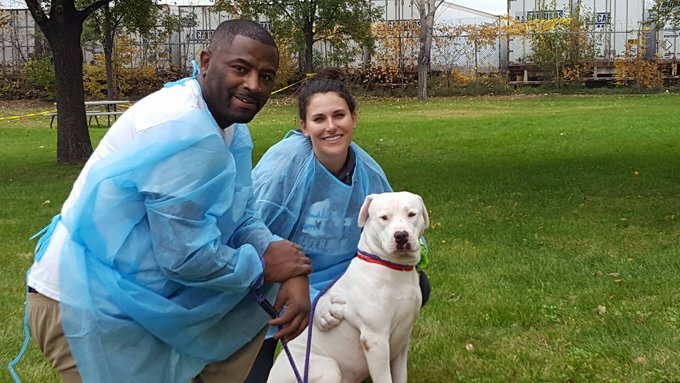 Partnering with the Best Friends Animal Society and Chicago Animal Care and Control, they began advocating for, supporting, and re-homing these animals, thus saving the lives of hundreds of dogs caught in the red tape of the legal system. Court Case Dogs have either been voluntarily relinquished by the owners or are transferred via court order. That’s when Safe Humane, a 501(c) (3) nonprofit organization, steps in. The dogs become part of a program where Safe Humane evaluates them, engages volunteers and interns to socialize them in preparation for a new life as family companions, and then the dog is transferred to partner rescue groups who find them a forever home. The Court Case Dogs transferred into the program have had difficult lives and unjust treatment, but show amazing resilience in moving beyond their painful histories. Safe Humane offers the tools to make that transition possible. All of the dogs are behaviorally accessed and then given the training, socialization, and long-denied love they need. Volunteers walk the dogs and help them as they participate in obedience/manners classes. These animals also get – some for the very first time – a taste of carefree play as well, running off-leash with other dogs in playgroups. While at the shelter, Court Case Dogs are spayed/neutered, given vaccinations (DA2PP and Bordetella) and rabies shots. They are tested for heartworm and any medical issues are addressed. Families that adopt a Court Case Dog get help from Safe Humane with additional training and behavior support. Safe Humane’s programs focus on education, advocacy and second chances for deserving animals. The Court Case Dogs program is a partnership with community policing networks, police departments, county prosecutors and circuit courts. To date, they have trained more than 800 volunteers, followed hundreds of court cases, and had a positive impact on arrests, convictions, and remedies. Before Safe Humane’s involvement, dogs involved in these cases were in a legal limbo, held as evidence before being routinely euthanized. 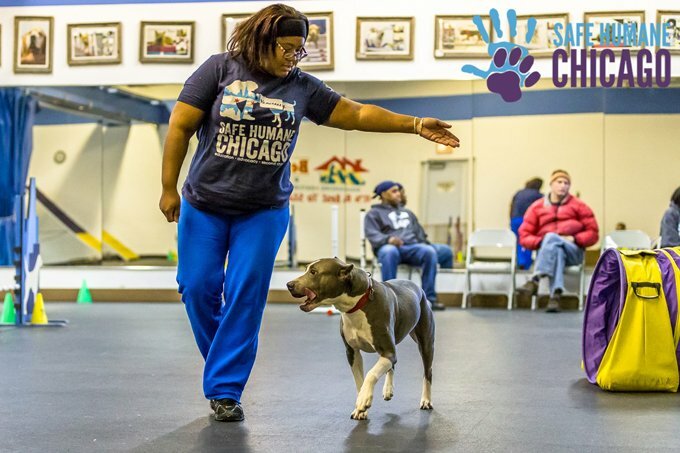 The founder of Safe Humane Chicago, Cynthia Bathurst, says that a partnership with Chicago Animal Care and Control (CACC) and other government and nonprofit organizations is changing the perception of “evidence animals” and ensuring more humane outcomes for them. About 75% of the dogs seized as evidence in these types of cases are now able to be placed in loving homes and given a second chance at a better life. Safe Humane serves as the “matchmaker” in the process, transferring them to rescues in Chicago, and even helping to place the animals in appropriate homes in other parts of the country through partner rescues. In fact, rescues throughout the country are invited to welcome Court Case Dogs that are available for adoption. 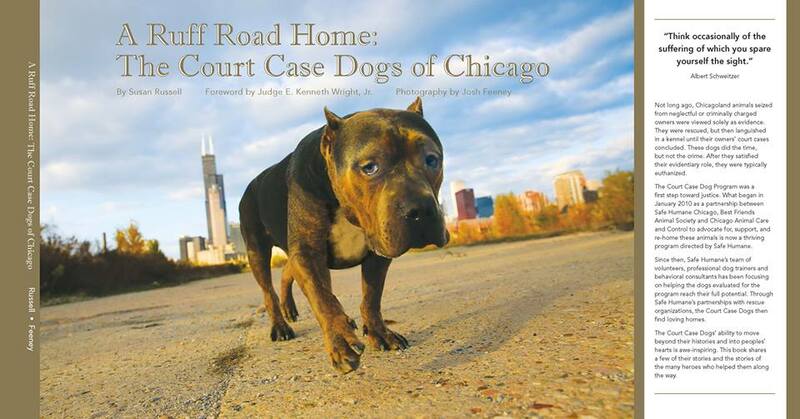 To learn the stories of the journey of these deserving dogs, Safe Humane Chicago offers a book called The Ruff Road Home, created as a pro-bono effort to both raise awareness of and funds for their important work. Beautifully photographed, the book also tells the story of heroes: rescue organizations and volunteers who help give animals that have “done the time but not the crime” a new and happier life. You can order a copy and support their efforts by contacting the organization via email. Safe Humane’s goal is to create and inspire positive relationships between people and animals. They focus on three areas: Youth Leadership, Collaborative Justice, and Court Case Dogs with education and advocacy. The only way Safe Humane can continue this work is with the support of the community. If you live in the Chicago area please get involved, contact Safe Humane and see how you can help. Donate time, money or supplies. Share this post on your Facebook wall to help educate others about Safe Humane and the wonderful work they do!